Happy customers are the secret to success. By putting out good products and services that people like and are willing to pay for is the most direct route to corporate success. Here are two diagrams that show that visually. In the above diagram the customer experience starts off with the "?" 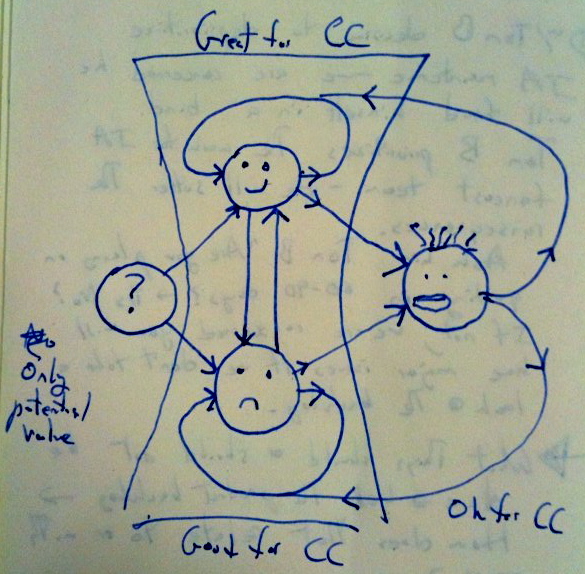 circle which in the potential customer has an experience and becomes either a "happy" customer or a "sad" customer. After that initial experience the customer can continue being a happy or sad customer, or they can switch from "happy" to "sad" or vice-versa. Then they can be a ex-customer, though one who talks about their experiences with your products/services. Of course it is possible that the ex-customer can once again become a happy or sad customer. In the above diagram. You can see three types of value/feedback from the customer that go down the left side.. You can earn there money right now in exchange for a product or service. They also have money in their wallet which is the potential for you to earn their money in the future. And lastly, they can talk/write about their experience with your product/service, aka word of mouth. Across the top are the 4 stages of customer experience. 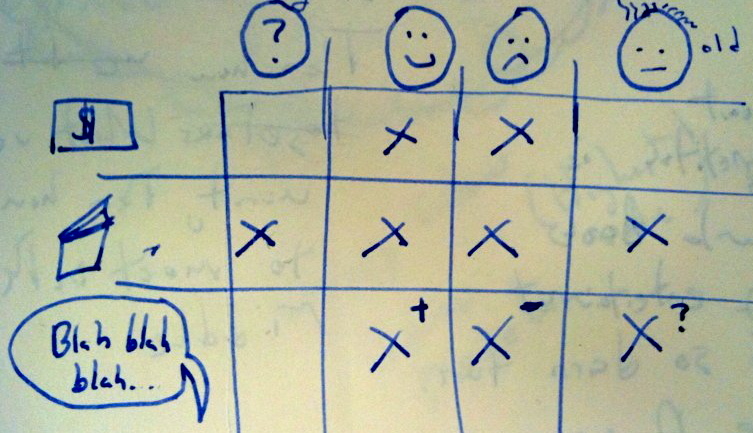 These related to the previous diagram, a "potential" customer, a "happy" customer, a "sad" customer, and an "ex-"customer. 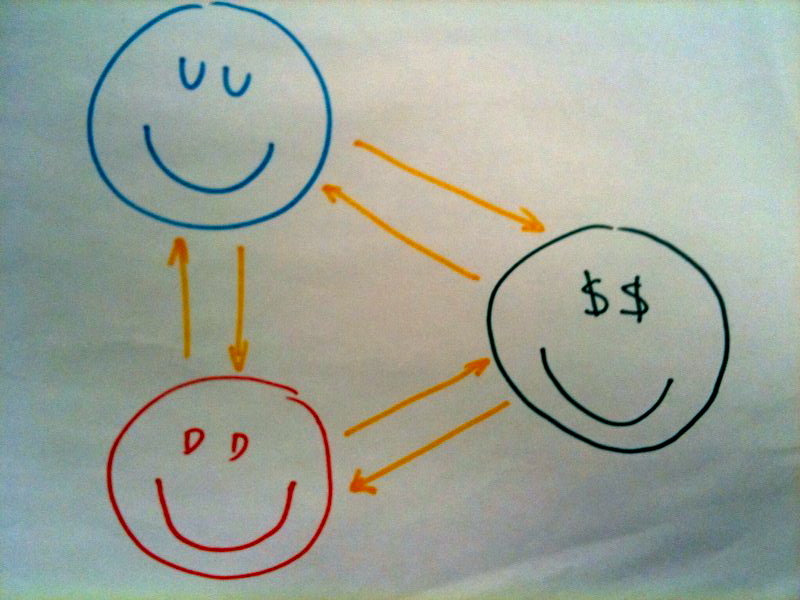 Lastly, above is another diagram that also visually explains "Happy Customers." This was done by Livia Labate. It is about happy customers leading to happy employees and how that creates a virtuous cycle that creates profit for the organization making the shareholders happy. This entry was posted on 12/01/2010 (Tuesday) at 4:47 pm and is filed under Uncategorized. You can follow any responses to this entry through the RSS 2.0 feed. You can leave a response, or trackback from your own site. I am really interested in how people are translating "happy" in their organizations right now. If happy is the ultimate goal by which we measure the success of a designed experience, how do we measure happy? What is happy? Are there aspects of happy that can be broken down and understood (and measured)? Great question. Roger Martin wrote that "Determining what your customer value and focusing on always pleasing them is a better optimization formula." So I'd say that we have to get really close to our customers and listen and observe what makes them happy and also what makes them sad. And add to that the happiness index work that has lately shown happiness to vary by country. That complicates the picture even more especially for multinational companies. I think most companies right now are focusing in on customer satisfaction, CSTAT. R755 theme designed by varometro. 43 queries in 0.701 seconds.